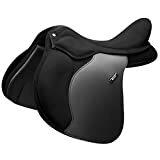 The English saddle is the general style saddle which is used for most sport riding pursuits. The English all-purpose saddle is designed to allow riders to use one saddle for both flat riding, and jumping. 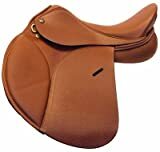 English saddles are light weight (compared to Western and Australian Stock saddles), have a flat seat which allows for close contact with the horse's back, and have two soft panels which suspend the saddle on either side of the horse's spine. English All-Purpose saddles. Perfect saddle while on a budget!! 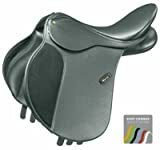 WINTEC 250 ALL PURPOSE SADDLE FLOCKED BLACK 17.5"